For over 30 years Rotowash has proudly lead the market in cleaning technology, supplying systems to thousands of customers in the health sector, government bodies, major industry, contract cleaning organisations and small businesses. With thousands of Rotowash customers cleaning millions of square metres of flooring daily, we have honed our expertise both as a manufacturer and a supplier. The valuable partnerships we have established with leading carpet manufacturers, flooring manufacturers, and cleaning chemical manufacturers enable us to aid you in identifying and assessing your specific floor maintenance needs. As a national company, Rotowash have a large team of skilled, technical sales representatives covering the U.K. All of our team carry a number of models for on-site demonstration, allowing you to fully evaluate our systems on your own floors. They also provide installation of all equipment purchased as well as training and certifying your staff on-site on proper use and daily maintenance. They are even available to retrain additional staff during the life of your Rotowash machine. Rotowash lead the market where high productivity, hygiene, cost effectiveness and quality are paramount. Rotowash machines produce a high quality wash, scrub and clean on all types of hard floors and carpets, leaving floors clean and dry within minutes. We manufacture machines in a variety of sizes to surpass expectations in any environment, from the smallest kitchen to the largest shopping precinct and everything in between thanks to intelligent design and a wealth of experience. The twin cylindrical contra-rotating brushes are housed within a strong compact aluminium unit containing separate tanks for clean and dirty water. Such compact design enables our machines to operate where other machines simply cannot reach: under shelving, behind cupboards and in tight corners, and with integrated transport wheels, transition from site to site is effortless. 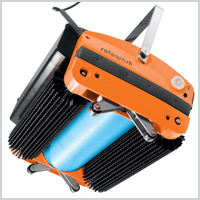 Rotowash machines can clean any floor type, be it flat or profiled, thanks to their specially designed brushes. Rotating at 650 RPM, they exert up to ten times the pressure of conventional rotary scrubbing machines, allowing the bristles to reach deep down into the irregularities of floors, such as grouted tiles, studded rubber, entrance matting and escalator steps. They are equally effective for scrubbing and buffing flat surfaces such as vinyl, terazzo and wood, and in the case of carpets, not only is the dirt extracted, the pile is also lifted, leaving the carpet clean, well groomed and dry within minutes. Rotowash machines use is up to 90% less water and cleaning chemicals than conventional cleaning methods, yielding numerous benefits: large areas can be cleaned between filling and emptying, facilitating consistently faster cleaning. Cleaning chemicals last longer and go further. Minimal water consumption also means smaller overall machine size, less weight to move and ease of use; a Rotowash is as easy to use as an upright vacuum cleaner. Rotowash is committed to high quality manufacture and equipment safety, which is why our entire product range carries British Standards approval as well as the major EEC design and safety certifications.